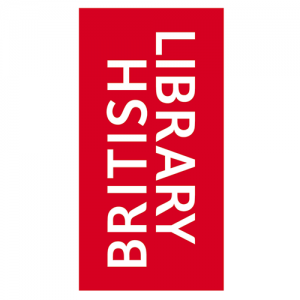 Art, music and literature blossomed in the Middle Ages, as evidenced by the wealth of sources in the British Library’s collections. Dr Alixe Bovey explores the evolution of art and culture in the Middle Ages. 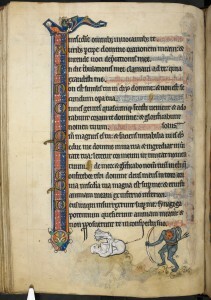 The Rutland Psalter was produced c. 1260 in England. 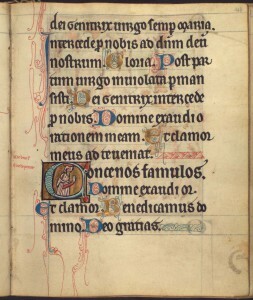 Alongside the Psalms, the book contains a number of illustrations, full-page and partial-page miniatures, and historiated and illuminated initials. What is particularly striking about the manuscript, however, is the marginalia. Alongside the Psalms, the text contains images of men, women, animals, hybrids, dragons as well as scenes of daily life – albeit often influenced by Bestiaries. 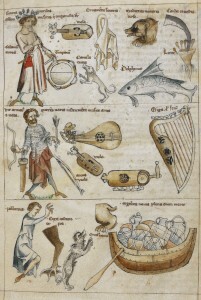 In this image we can see a selection of common medieval musical instruments including the organ and the hurdy-gurdy, a string instrument. Manuscripts often show music being performed in many different scenarios, from the entertainment at banquets to a crucial part of religious prayer at funerals. 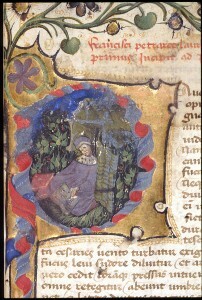 The second marginal image depicts the wholly fictional creature, the web-footed sciopod, a tiny one-footed beast which could use its large foot as an umbrella. Creatures like the sciopod, which often had some human qualities, were thought to exist in foreign, unexplored lands. Compared to today, few people were able to read and write. Those who could were mainly church men (and, to a lesser extent, women), who read and composed works (mostly in Latin) ranging from commentaries on the Bible, philosophy, history, and the saints, to romances, ghost stories, and bawdy tales of misadventure. However, as an ever-more wealthy, literate and largely urban population developed in the high and later Middle Ages, so too did the audience for sophisticated writings. People read (or listened) for entertainment as well as education. A growing number of rich and aristocratic patrons had an appetite for many kinds of writing: books told of the exotic adventures of noblemen and women; of ancient battles and love stories; of the crimes of sinners and villains, and of the deeds of saints and heroes. This growing interest in literature is also reflected in the emergence of vernacular texts – texts written in Italian, French, English and so on – especially from the 1100s onwards. Whereas Latin writing was produced by and for a largely clerical audience, this new literature was accessible to a broader public. Celebrated writers like Dante, Petrarch and Boccaccio wrote their major works not in Latin but in their native Italian; Marie de France, Guillaume de Machaut and Eustache Deschamps wrote in French; and William Langland, Geoffrey Chaucer, and the anonymous Gawain poet composed pioneering works in English. Meanwhile, many anonymous works in European languages also circulated. Medieval literary manuscripts often use large, beautifully decorated initials to indicate the start of a new section of the text. 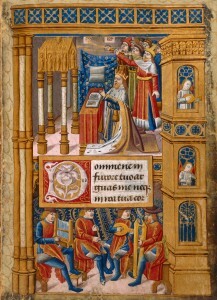 The example here is of a historiated initial, which depict recognisable people within the space of the opening letter of the text. This is a portrait of Petrarch, an Italian scholar and poet often considered to be the father of Humanism, who wrote in his vernacular rather than in Latin. Manuscripts written in the vernacular allowed for a much broader audience even in the Middle Ages. 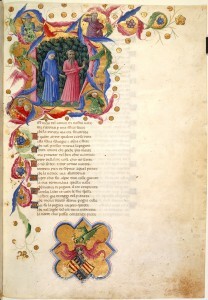 This historiated initial depicts Dante and his guide Virgil, the ancient Roman poet, in a dark wood before their descent into Hell, a scene from Dante Alighieri’s ‘Divine Comedy’. This iconic work is known for providing one of the most powerful portrayals of the medieval concept of Hell. 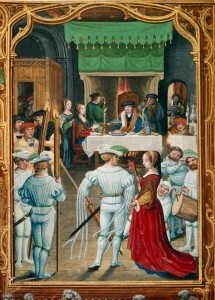 Pictured here in the margin of Thomas Hoccleve’s The Regiment of Princes, this portrait of Geoffrey Chaucer is assumed to be a realistic likeness of the author. 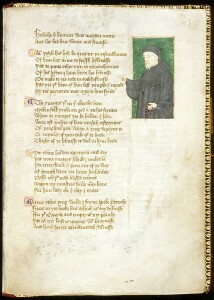 Chaucer’s most famous work, The Canterbury Tales, was popular during his lifetime, and the presence of his portrait here highlights his influence upon his contemporary writers. Medieval literary culture was as much about listening as it was about reading. Many English works begin by instructing the audience to listen, showing that the writer assumed that the text would be read aloud. In the popular romance Guy of Warwick, the audience is told to ‘herken to mi romaunce rede.’ Illuminations in many manuscripts show groups of people – often noble in status and in a courtly setting – listening to (or sometimes ignoring) a reader. Music was a major part of secular and spiritual culture in the Middle Ages. The development of music and its notation – that is, the way it was written down – can be seen in many manuscript sources.The most famous example of medieval song in English is the rota, or round, ‘Sumer is icumen in’, illustrated in the manuscript below. This composition is from a volume of mid-13th century manuscripts, which probably originated from Reading Abbey. The piece requires four singers to sing the same melody, one after the other, starting when the previous singer reaches the red cross on the first line. While this is happening, two lower voices repeat the words ‘Sing cuccu’. Instructions on how to perform the song are given in the bottom right hand corner of the page. ‘Sumer Is Icumen In’ is a composition for several voices that was probably written at Reading Abbey in the mid-13th century. This song, written in Middle English, was composed to be sung in the round, with four voices singing the same melody one after the other, accompanied by two lower voices. 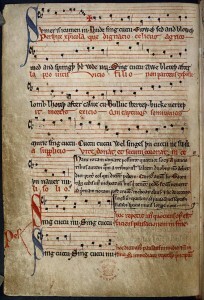 The manuscript is the oldest known musical round with English words. Singers, however, can choose between the Middle English lyrics which celebrate the arrival of spring and the lyrics in Latin (Perspice Christicola) which are religious. The manuscript is also the earliest known example of a piece of music in which both secular and sacred words are written to the same piece of music. 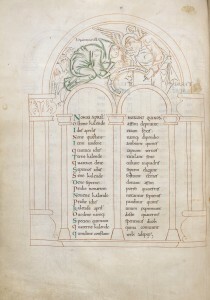 The text to the right of the page gives instructions in Latin for its performance as a round, the cross above the first line marking the point at which each of the four main voices enters. While this song was probably unknown between the 14th and 19th centuries, it was one of the best known in medieval times, and is now one of the most celebrated of all medieval musical compositions. The Middle English text includes lots of familiar animal names such as ‘cuccu’ (cuckoo), ‘lomb’ (lamb) and ‘cu’ (cow). Famously the ‘bucke’ (buck) is said to ‘farteth’: the first record of the verb ‘to fart’. Manuscripts also contain many images of music being performed, showing not only musicians and musical instruments, but also the range of settings in which music was performed, including religious observances such as the Divine Office (the daily cycle of prayers performed by monks), funerals, and also secular settings such as banquets, balls, tournaments and fairs. 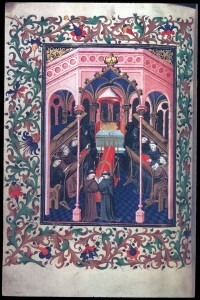 Music was a key aspect of religious life and was a significant feature of medieval funerals, as depicted in this Book of Hours. Choral singing, here sung from books rather than memory, was thought to help elevate the soul towards Heaven as well as easing the grief of those attending the funeral. The Golf Book is a book of hours: a religious text that contains prayers and psalms for private worship. 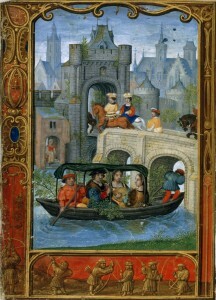 It was written in Latin in Bruges, Flanders, around 1540. The Golf Book is particularly well-known for its miniatures which are attributed to one of the most celebrated artists of the time, Simon Bening. Only part of the manuscript survives. It includes a calendar which records the religious festivals and saints’ days. 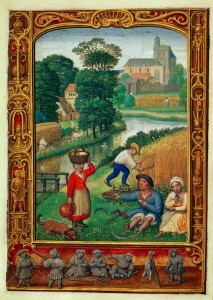 In the Golf Book, each month is depicted with an outstanding illustration of the labours of the months: 12 scenes depicting activities (both agricultural and leisure pursuits) that took place during the year, all entirely typical of books of hours. 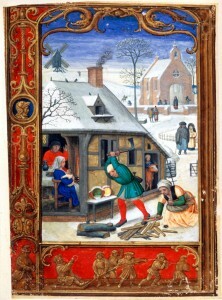 The lower margins of the page are decorated with illustrations of contemporary sports and pastimes. The Golf Books contains a representation of a game resembling golf, which has given its name to the manuscript. See more of the Golf Book on Turning the Pages™. Common medieval instruments included the harp, the lute, the bagpipe, the hurdy-gurdy, the psaltery and the lyre. As very few medieval musical instruments survive, manuscript illustrations are vital way for historians to learn about music. Musicians classified instruments into two categories: quieter instruments that were designed to be played indoors and louder ones which were to be played outside, usually during processions. These labelled string instruments, a harp, viola, lute and hurdy-gurdy, would have been used for playing music indoors. Minstrels, who sang songs telling of romantic characters and faraway places, were commonly found entertaining wealthy aristocratic households but also performed in the streets of some prosperous towns. Their songs were often accompanied by acrobatic skills, tricks or jesting. Medical practitioners believed that music had powerful restorative qualities: it was believed to alleviate melancholy, aid the healing of wounds, and even to heal paralysis. King David, from the Old Testament, depicted here as a medieval monarch, was highly regarded for his musical talent, and the healing power of his music was glorified in the Bible. 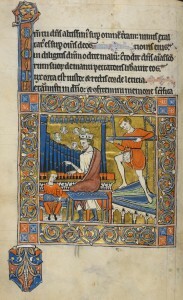 Often depicted player the lyre or organ, here we see the king at prayer, accompanied by courtly musicians. 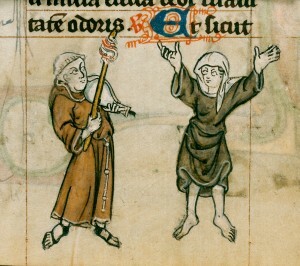 Some images show evidence of negative attitudes to secular music, such as a tiny satirical marginal image in a Book of Hours showing a friar holding a pair of bellows like a fiddle and scraping out a tune with a distaff while a barefooted nun, who has hitched up her habit and flung her arms in the air, does a rude dance. This marginal image within a Book of Hours, a devotional text, depicts a friar and a nun misbehaving as they entertain themselves with music and dancing. Accompanying important religious prayers, these types of images are frequently used for their comic value. Illuminated manuscripts are a precious source for learning about medieval visual culture, especially since they tend to be much better preserved than, for example, paintings on panels or walls. In the early Middle Ages, most illuminated manuscripts were produced in monasteries and had a religious theme: angels or saints, for example. The majority of illuminated manuscripts produced during the early Middle Ages were religious, as seen here with this personal prayer book. This illustration depicts an angel handing St Pachomius a scroll containing the Easter tables which would have been used to calculate the date of Easter each year. By the 13th century, this had begun to change: professional illuminators, often located in towns and cities, began to take over. One such illuminator was William de Brailes, who included an image of himself in the Book of Hours below painted c.1240. These professional book producers were able to respond to a growing demand for books by people outside of religious contexts, including students and lay people. By the later Middle Ages, professional illuminators, as well as monasteries, were producing illuminated manuscripts. This historiated initial is an idealised self portrait of William de Brailes who created this manuscript in the 13th century. The growth of professional book producers also led to a growing demand in non-religious books. 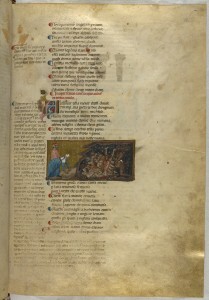 Images in manuscripts relate to their written texts in a number of ways: sometimes, they represent the author, owner, donor or patron; in other instances, they are used to articulate the text, making it easier for readers to find their way around the book; and often the images comment on the text in some way, sometimes acting as a visual commentary on its content or on the circumstances in which it was produced, or in which it might be used. Images are not necessarily less important than the text in medieval manuscripts: sometimes they take priority over word, or stand alone without text, as for example, a focus for prayer and meditation. In many instances, especially in the later Middle Ages, marginal images were often humorous or even rude, perhaps intended to distract readers from the text with playful imagery.